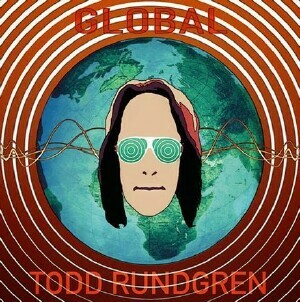 Never an artist to rest on his laurels, the ever-evolving Todd Rundgren is back with the new “Global” album, which is a curious mash-up of Philly soul, new wave pop, and electronica. Maximum Ink’s Sal Serio, a restless artist in his own right, had the opportunity to speak with Rundgren about “Global”, and his upcoming tour, which stops in to the Pabst Theater in Milwaukee on Tuesday, April 21. MAXIMUM INK: On the upcoming “Global” album tour, the musical line-up is just yourself and the D.J. Dam-Funk. What sort of challenges does that present with the song arrangements and/or the live presentation of the music? TODD RUNDGREN: I tried to DJ myself, the last tour I went out on, the “State” tour , and that turned out to be hugely challenging for me, because, as opposed to most DJs, I have to sing and front the songs as well. I discovered that I couldn’t do a very good job of DJ’ing and cover all the vocals that I had to, so I wanted to try and modify the concept a bit, and find someone who not only could cover the music for me, but also warm up the audience [with] material of his own that he can perform in cases where we need an opening act, things like that [laughs]. But, also is something that I think my audience can appreciate. So, I’m thinking, from my standpoint, the challenges will be far less daunting than they were the last time, and perhaps more daunting for Dam-Funk [laughing]. So, you’ll have to pose that question to him! I’ll be organizing and directing the show, of course, but my principal responsibilities are just to sing and front the band… or “the act” [laughing]… [let’s] put it like that. MI: What other visual or stage elements should fans expect on this tour? TR: We’ve got two singer/dancers, and we’re preparing for the size of the venues we’re in. We’re carrying a pretty spectacular set-up of lights and video, so, it’ll be a whole multi-media experience in that sense, but, not so [much] “shock and awe” as the “State” tour was. It’s going to be more of a revue, more of an actual “real show”, as opposed to a series of songs. MI: The lyrical content of “Global” could potentially be interpreted as having environmental or social concerns. TR: The idea was to take a planetary consciousness approach. A lot of my records are very insular. They’re about human nature and human psychology… things like that. In this particular instance I’m externalizing a lot, and trying to delineate issues that we all need to confront together. So, the album has these aspects of cheerleading, you know, trying to get everybody on the same page, and [have] a positive attitude to deal with these issues, and try to delineate what those issues are. In that sense, yeah, you could say it’s environmental, but it’s more about the way we interact with each other than about any particular environmental issue. MI: You are an artist that always seems eager to reinvent yourself. Was there ever a time in your 45+ year career that you felt “stuck”, or going through the motions? TR: Well, that was “Something/Anything” … [laughing] my third album and the one with all the hit singles on it, and the one that caused such consternation when I didn’t follow-up with a similar record. But, I listened to “Something/Anything” after a while, [and] I realized that I was writing out of formula. I was writing love song after love song, because that’s what people wrote about. It wasn’t because that was all that was in my head. I started to realize it’s time to start examining the musical landscape inside my head and try to represent that a bit more realistically. So, in that sense, I’m wandering around that landscape, and getting different viewpoints on it. Adding to it. Sometimes going to foreign lands in my mental world [laughing] and trying to take snapshots of what’s there. MI: Have you ever cataloged the number of songs you’ve written, or published? TR: I haven’t, but between my own records and the records I’ve done with Utopia, and possible contributions to other people, I don’t know… you could do the math. This is my 25th solo album, and if there were an average [of] ten original songs on each one, that would be 250 songs [right] there. So, at this point I guess it’s well over 300, at least. MI: Being from Wisconsin, it’s common at Green Bay Packers’ games to hear “Bang The Drum All Day” every time the team scores a touchdown. MI: I sure hope you get a slice of the pie every time that song is used in a major sporting event. MI: You are known as much as a producer as a performer. Are there new production projects coming up? TR: You know, things come up, and as the world of music has changed, things don’t get locked in the way they used to. I’ve had a couple of interesting possibilities, but the artist asked me if I’d be available and then said they wanted to think about it a little more. Another one, they just wanted me to be more of a sounding board, because at this point I’m essentially committed and I don’t have the time to participate with it. That was always the problem. I probably would have been the producer for the Talking Heads, except at the time they wanted me to work with them I was already doing another record, and couldn’t. So, there are conflicts that prevent you from doing some of the projects you want to do. [At] this particular time all of my touring seems to be conflicting. MI: I was recently looking at a list of the best selling albums of all time, and noticed that Meat Loaf’s “Bat Out Of Hell” record was in the top ten. Was that the most successful record you’ve produced? TR: Oh, far and away, yes. I mean, I’ve had some other gold records and things like that, but that was multi-multi platinum. By some estimations over 30 million copies sold. MI: That just goes to show you, Jim Steinman writes a song about getting laid in the back seat of a car, and gets Ellen Foley to sing on it, and it sells 30 million copies! MI: You and your wife Michelle have initiated the Spirit Of Harmony Foundation, whose mission is to support opportunities for children to have access to music education, and expression through performance. What projects have the Foundation already completed, and what’s up next? TR: The Foundation came together really quickly… more quickly than these things usually do. It started when we were having a fan retreat on a plantation about an hour outside of New Orleans. And the fans all decided that they wanted to do something for New Orleans. They got together and took a collection and came up with $10,000, which we donated to a music program in the Lower Ninth Ward that essentially had gotten a lot of their stuff destroyed during Katrina, and was still trying to recover. We went [there] and they did a little recital for us, and everyone felt so good about it that they said we have to make this a permanent part of our identity. So, the fans encouraged us to put together the Foundation, and we got our non-profit status in, like, record time. [laughing] I don’t know why! Maybe they just had all the paperwork properly prepared or something. So, we were almost caught flat-footed when that happened, and first of all we had to start raising enough funds for our basic operations, so people that worked for the Foundation can be remunerated. A lot of that was just online auctions, and various fans around the country, and other contributors, having little events of their own to raise some funds to go to the Foundation. Most of that so far has essentially gone to getting us set up. Now we’re moving on to more practical issues. We’re having a big seminar in Little Rock [April 17-19] at the Clinton [School Of Public Service], and we’re going to have a lot of participants there, to help refine our mission [and] develop our synergies with other people, because we don’t see ourselves as principally a fundraising entity. We want to be a hub to identify a need, and connect that with someone who will satisfy that need. As opposed to us having a giant bank account and then doling it out to people. Because some of these programs are very worthwhile, and not part of a regular school budget, or something like that. They have to raise their money every single year. And, some of them have, like, 3 or 4 million dollar budgets, because they’re dealing with hundreds of kids. We could make that our entire mission, just trying to raise money for one single program. So, instead of that, we want to develop our resources and connections to pick out a program that is worthwhile, and “worthwhile” usually means that it’s got really committed people there already. And, help them get the resources they need to keep their program thriving.